A modern museum building – executed by the Oswald architects office, „Architekturschmiede“ in Kirchdorf i.W., and inspired by museum designer Michael Hoffer – transfers the circular movement of the permanent exhibition to the outside. It thus realises a dramatic composition of architecture, space and exhibition. The uprising, glass fronted building, with its rotating wings, expresses the representative significance of glass for the aspiring high civilisations of Europe. 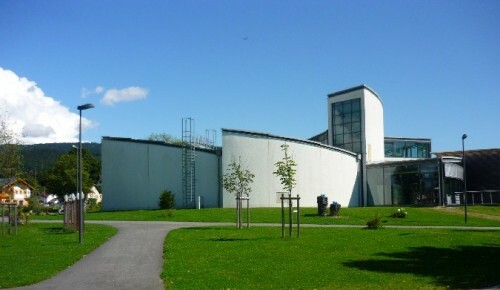 The outer wall of this circular building follows the museum journey of cultural history in the inside – with the roof construction swinging upwards for each civilisation epoch, and opening towards a large artistic window where artists have, using modern means of expressions, visualised the relationship to the respective times to glass. The side building is deliberately set into contrast with this: The wooden cladding and low roof emphasises a sense of the horizontal and the utilitarian. This part of the building contains the former machine hall of the saw mill, which later became the first glass museum, and hosts the offices, the library and archives, all event and gathering rooms and further function spaces of the Glass Museum.